Winning Drones are Built, not Bought. What’s In a FPV Racing Quad? the best racing drones to buy. 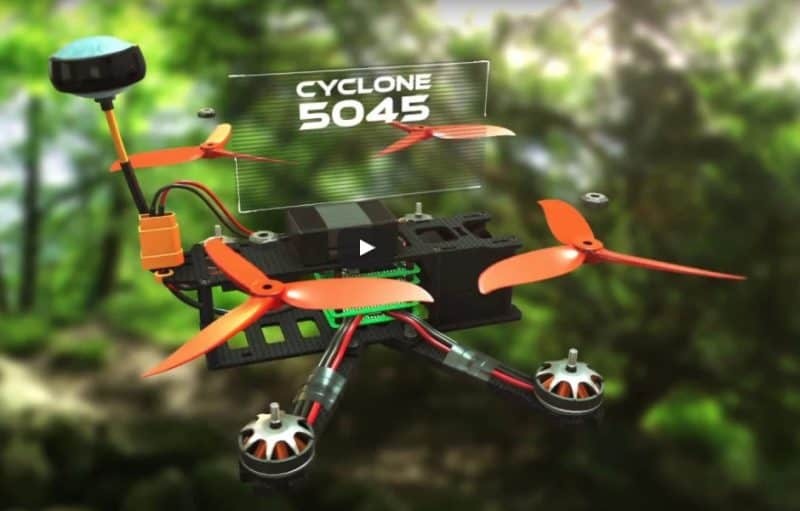 A racing drone is a small quadcopter unmanned aerial vehicle (UAV) that is purpose-built to compete in FPV (first person view) racing events held in most major cities around the world. See the list of drone events below, for more details on these. NOTE: Racing drones are not the same as camera drones like the Phantom 4 Pro. Camera drones like the Phantom fly “slow and low” and are designed to capture high-quality video of surfing contests, real estate and landscapes. A racing quadcopter’s camera can’t do that. 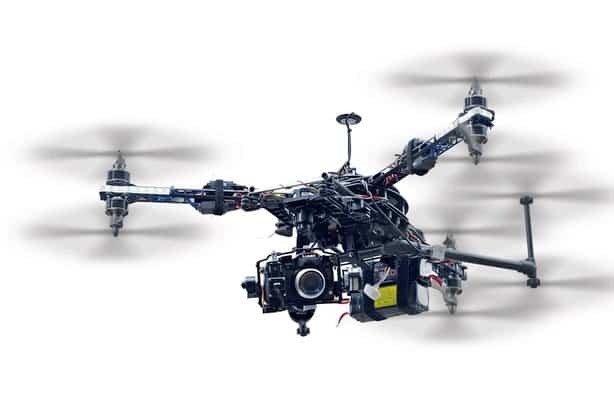 To learn more about camera drones check out our camera drone buyer’s guide. This racing drone guide does not cover advanced modding; the intricacies of optimizing components; nor, detailed DIY assembly instructions. We also don’t discuss technical performance parameters, like the correct prop blade angle of attack. RotorBuilds.com – dozens of custom builds, crowd-ranked and tested. I love the Purple Haze. 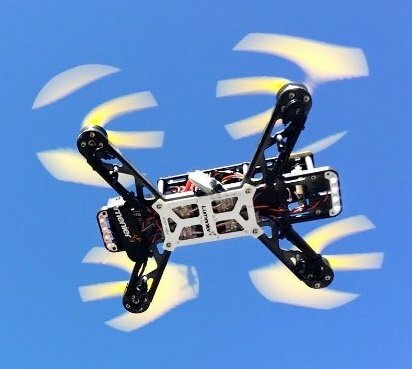 After reading this guide, you can learn more about some of the leading racing drones for sale today by reading our reviews. The following three picks are Ready To Fly (RTF). Little to no assembly required – you can fly them right out of the box. A nearly unbreakable Tiny Whoop FPV drone that is perfect for first-time racers. An affordable and durable ready-to-fly FPV drone, suitable for 250-class events. Lightweight, durable and super-fast 250 class winner for experienced quad pilots. Easy repairs, too. Hubsan H107D FPV X4 – a great starter drone that’s starting to show its age. Less than $100. 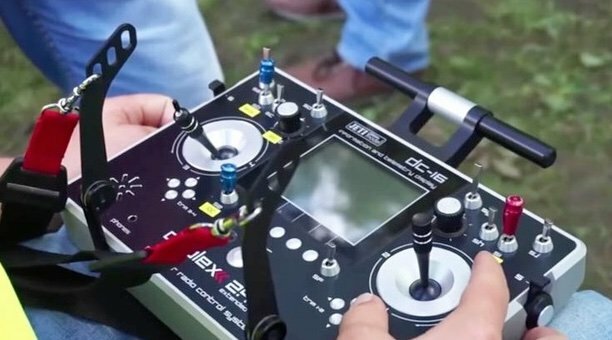 If you take a close look at drone race results, you’ll notice that pretty much every winning drone was custom-built by its owner. That’s because drone racers modify their aircraft – a lot. Just like in other forms of competitive flying, drone racers are constantly looking for new gear and tweaks that will give them an edge. Modding is common in drone racing because drone technology is advancing very quickly. If you are new to drone flying or racing, then you definitely should start out using an inexpensive ready-to-fly (RTF) mini drone. Buying an starter FPV drone is important, because you’ll want to learn how to race and get comfortable flying through a camera view, without losing a bunch of time and money. And believe me: you WILL crash your drone, many times. You WILL make mistakes. Better you learn on a less expensive platform – right? A Tiny Whoop class micro quad FPV drone is the top choice among budding drone racers, today. 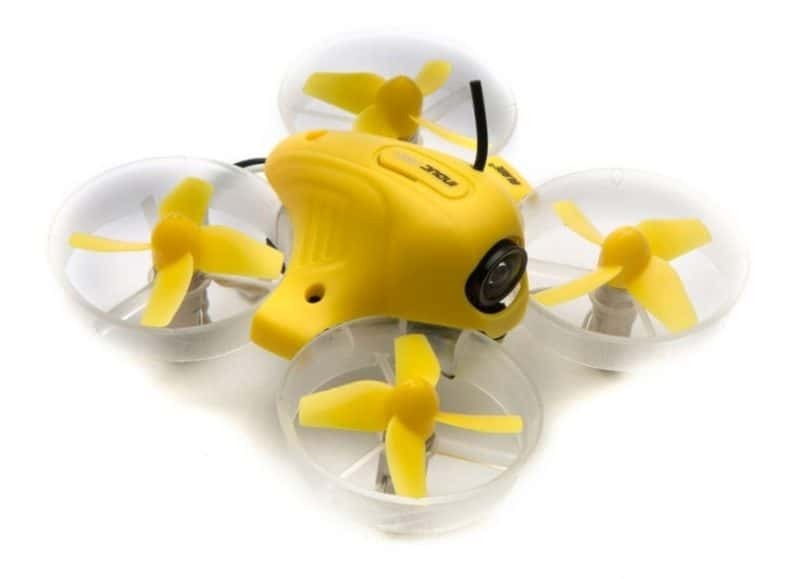 For example, the Blade Inductrix FPV is inexpensive, light and almost unbreakable. 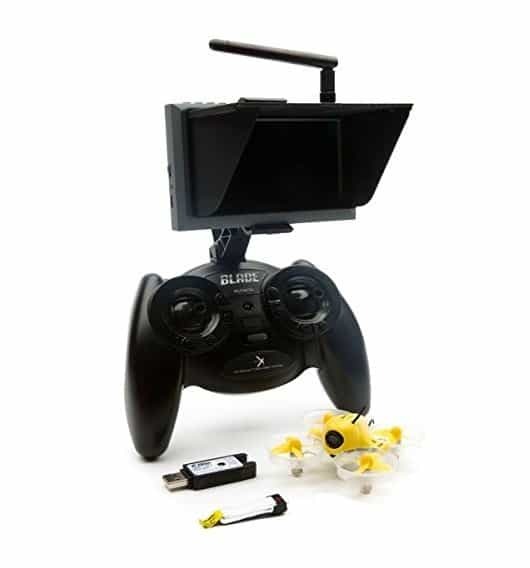 It comes with an integrated fixed mount camera and an RC Transmitter with a controller-mounted FPV monitor. It has everything you need to learn how to race using FPV video. After you’ve mastered flying a micro drone inside, you’ll be ready to move up to assemble-and-mod racers like the Vortex 250 PRO – and start WINNING. The first thing you need to decide when buying a racing drone is whether you will compete in a racing league or in less formal events and meetups. The racing format will dictate the type of aircraft, controller, FPV gear and budget you’ll need to compete and enjoy racing. 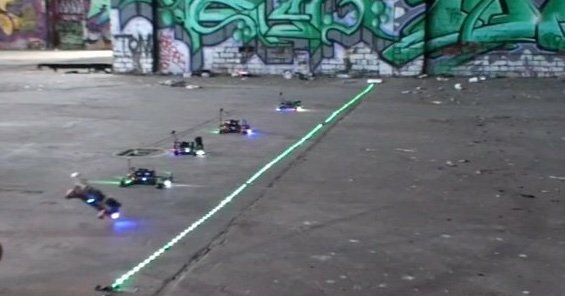 Drone racing leagues are popping up all over the world right now. Each league has different rules that dictate the type of equipment (standard spec or open spec), the race environment, rules for combat and overtaking, etc. etc. 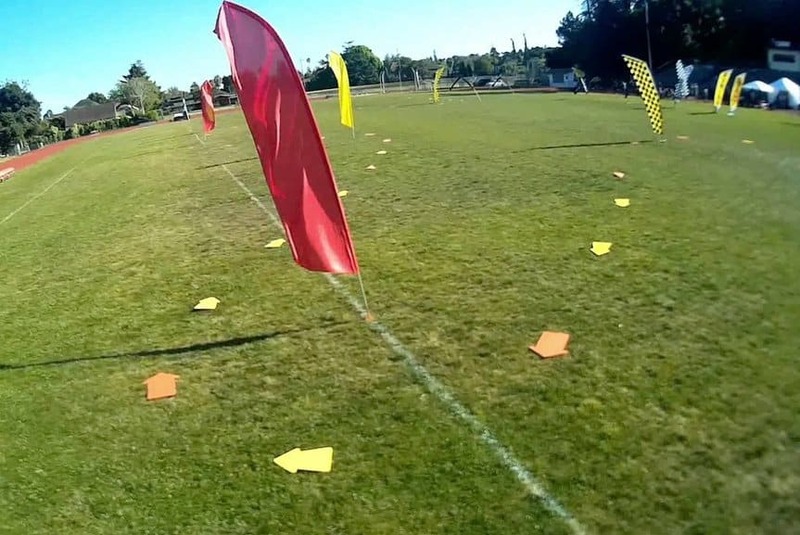 Aerial Grand Prix: A gates-and-flags racing league for 250Mini, Pro Super Mini and Open Class rigs. Events in major cities world wide. Indoor and outdoor tracks. 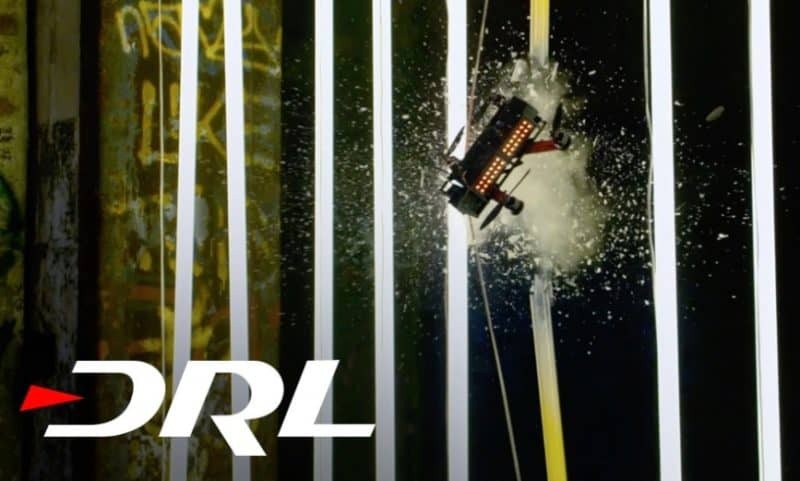 Aerial Action Sports League: a 3-hour stunt drone and combat drone event. FPVRacing.TV: a social network of racers organized into teams. Open-spec. Lists global events. MultiGP: for first-person view (FPV) radio-controlled quadcopters only. Started in 2015, currently adding US city chapters. RacingFPV.com: Canadian indoor racing league; 250mm and open class. Flags and gates. Make sure you record the minimum and maximum specs for suitable aircraft in the league you like best. Many leagues today use 250 mm / 5-inch mini quads. For a map of upcoming racing events, check out this map maintained by the reddit.com/r/Multicopter/ community. 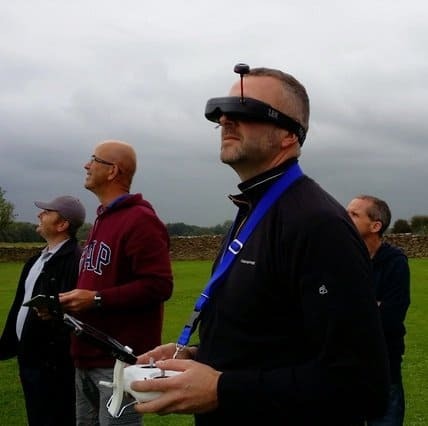 In addition to drone racing leagues, there are plenty of local User Groups, FPV Meetups and similar events happening in most US and European cities today. Most local events are open-spec, meaning they’ll accept any and all types of aircraft and controllers. The main purpose of a meetup is to have fun and to learn from each other. Socializing is also a goal, but it can be difficult while everyone is wearing a pair of FPV goggles. 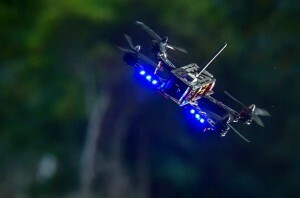 You can find local drone racing meetups and user groups on Meetups.com and Reddit. I prefer local meetups, because I’m free to do whatever I want with my aircraft. And, I tend to learn more about mod options from racers who are constantly modding their drone. But that’s just me. Most drone racing league events take place inside where weather is not a factor. This is to ensure that no drone has an unfair advantage due to the environment on that particular day. The idea of league racing is to pit machine and team vs. machine and team, competing purely on piloting skill and equipment design. On the other hand, local meetups and user groups race wherever they can find a suitable course. Indoor and outdoor meetups exist in most cities. Two or more racers compete at the same time to see who crosses the finish line first. Crashes happen. Most exciting format! A race between two or more drone racers at the same time, to see which one accelerates over a short distance the fastest. Distance is 100 yards or 100 meters, usually. A ready-to-fly (RTF) racing drone like the Blade Inductrix FPV and the Vortex 250 Pro will come with everything you need, integrated and bug-free. You may need to buy extra props and batteries, though. 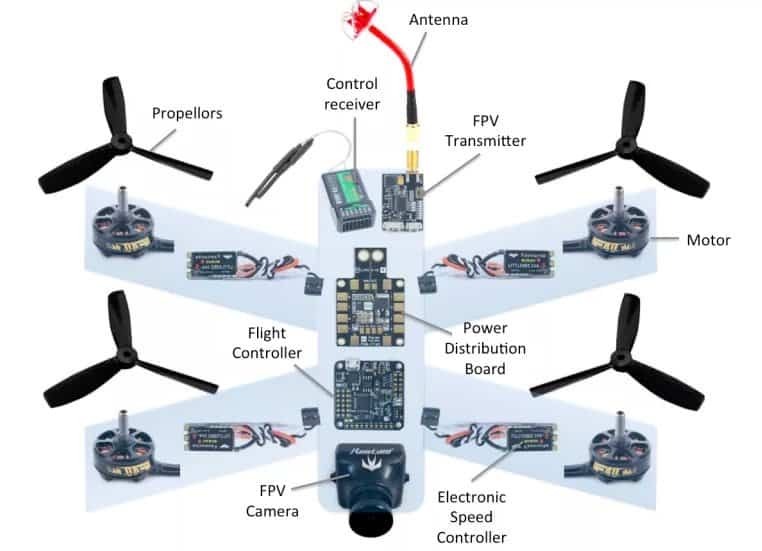 If you choose to assemble your own (ARF), then make sure you get everything listed above – with plenty of spare props and a couple of extra batteries. You can get into drone racing for as little as $200, but WINNING races will cost more. If you’re not into assembling your own drone, then you can purchase a ready-to-fly racing drone like the Blade Inductrix for as little as $200. 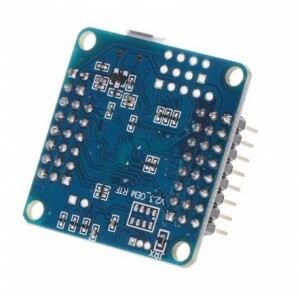 The Inductrix is a fast, inexpensive micro quad that includes an onboard camera, reliable RC controller with live feed video display and excellent controller software. You probably won’t win many events with it, but it will teach you the ins and outs of racing without risking a lot of time and cash. 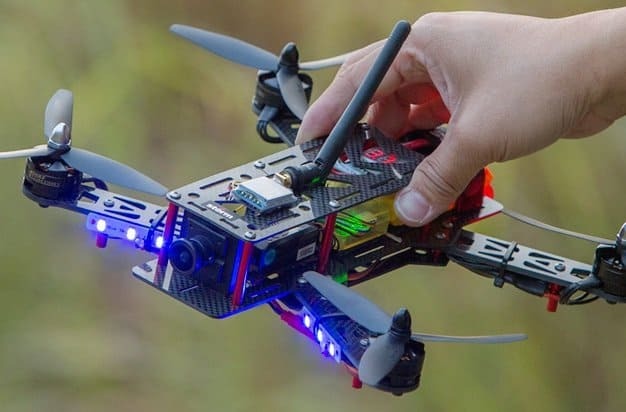 To compete in local meetups, a budget of $300-700 will get you a 250mm spec racing drone with a good RC controller, flight controller, FPV video feed and a small video display. 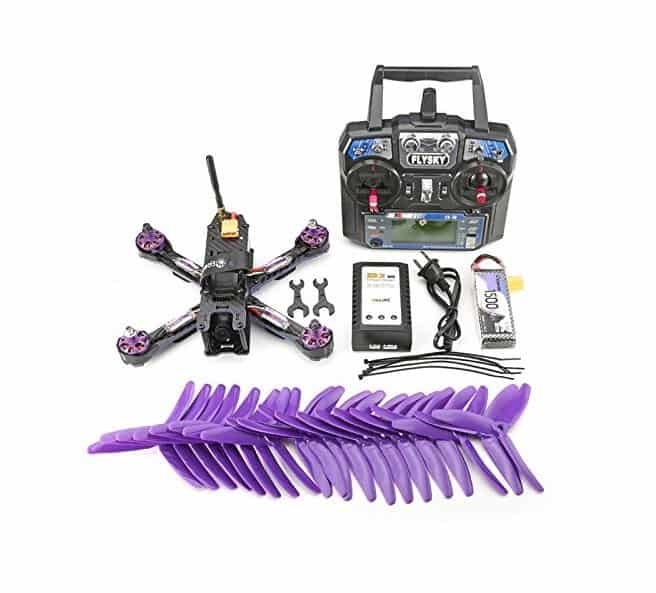 The Vortex 250 Pro and Eachine Wizard X220 are two popular choices for first-time competitors. 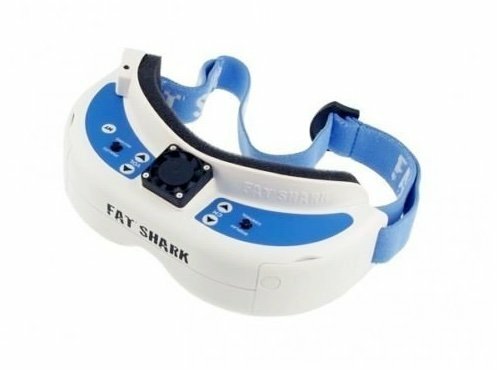 Add another $300-500 for a pair of high-quality first-person-view (FPV) goggles like the Fat Shark Dominator V3. Budgeting for a racing league? you should budget at least $1,000 to build a competitive racer for any league. The following manufacturers and retailers sell ready-to-fly (RTF) racing drones. Ready-to-fly quads are exactly what they sound like: you buy one, open the box, charge the batteries and start flying. Most of the kinks have been worked out. Here are some of the more popular RTF Racing Drones sold today. Blade Inductrix FPV (Tiny Whoop class): cheap and popular starter mini-drone; complete w/ 720p FPV camera, controller and excellent software. Tiny and tough. Eachine Wizard X220 FPV: popular, fast (68 mph) and affordable, this FPV drone is durable, a lot of fun and a great value. Lots of upgrades are available. Walkera 210 FPV: a popular entry-level RTF racing drone sold on Amazon. Diatone Crusader GT2 200: one of the fastest RTF racers you can buy. Not cheap! Vortex 250 PRO: this racer by ImmersionRC is capable of winning 250 class events. It’s also tough as nails and repairs are easy/cheap to make. Caution: lots of RTF racing quadcopters on the market today are actually assembled from kits and components by the retailer. This doesn’t mean they bad, just that you’re depending on the retailer staff to know what they’re doing. I was going to write a long-winded guide on this. But honestly, the following 30-minute tutorial by Charpu, one of the best racing drone pilots around, explains the process better than I ever could. It’s a couple of years old, but Charpu knows a crapload more than I do about this. In short, it’s not that hard to build your own FPV racing drone. Tweaking it to win is where the risk / reward starts to get tricky. I don’t have enough experience to list every possible quality component in the racing drone world (who does?). But based on my experience and research, you won’t go wrong buying any of the following components. Note: some of the links below are affiliate links to Amazon.com and other hobby sites. Motor power ratings are based on Kv (thousands of RPM per volt). For a smaller 250mm spec racer, your motor’s Kv rating should be 1000-2300Kv. Use a lower Kv for larger quads. See how the most popular motors compare in real-world performance tests on MiniQuadTestBench.com. KISS 24A Race Edition: Expensive, high quality, proven. HotProps: FREE. Based on Unity engine. Lots of equipment choices. Offers multiplayer option. Relatively new. Velocidrone: full version is $25. 17 real life models, 14 maps, multiplayer option. Graphics are OK.
DRL Simulator: FREE. lots of fun, but physics aren’t the best. 250mm only. 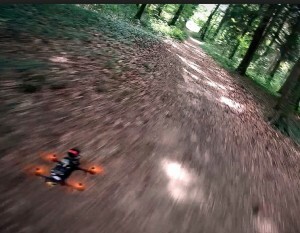 FPV drone racing is more of a piloting skill test than a drag race. Racing quads today can exceed 75 miles per hour (120kph). But top speed isn’t everything in flags-and-gates racing events – maneuverability is. Lift power is always important. 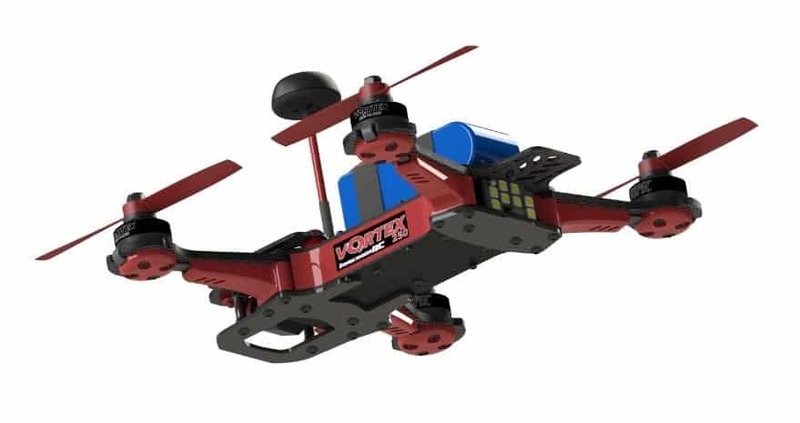 More powerful motors and more efficient props provide more lift, which helps you make it around sharp corners and accelerate out of a turn faster than your competitors. Today, it’s not unheard of to have a racing drone with a 10:1 power-to-weight ratio! 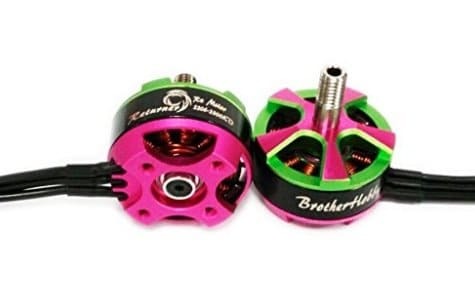 For drone racers, you’ll want to use high-quality 3S and 4S motors like those made by Cobra. For props, carbon fiber is a popular choice due to the lightweight and extra-thin, efficient design. But beware: super-strong CF props can injure, because they don’t “give” when they hit your skin. This is the most important performance characteristic of any racing drone. It’s not something you can quantify easily. In general, using higher-quality components will improve the characteristics above. The smaller and lighter your aircraft is, the more durable it will be. 250mm spec and smaller Tiny Whoop class are the most resilient to crashes and accidents. They tend to sacrifice their props instead of damaging the frame. Drone races rarely last more than 5 minutes. Most racers are designed for 5 minutes of hard racing, which saps batteries really fast. Camera drones are the exact opposite – their goal is to fly “low and slow” for 15-20 mins. There are many RC controllers available for quads these days, costing from $100 to over $1,000. For racing, you mainly need a reliable controller with extra-smooth, precision manual control sticks that is durable and weatherproof. Long battery life is a plus. If you want to do special tricks, stunts or combat, make sure you have enough programmable buttons to support them. Spectrum DX9: expensive; 9 channels; popular choice of serious racers. Spectrum DX6i: 6 channels; less expensive; great for beginners. 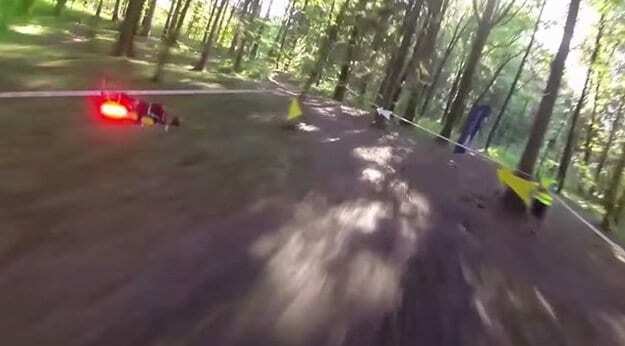 First person view (FPV) is how most people prefer to race. The reason is simple: it puts your eyes directly on the nose of your aircraft as it flies, making the race a LOT more exciting (and challenging). FPV video can be streamed to a video display or to FPV goggles. Not all drone racers are used to turn corners faster than others. Some are further modded to perform acrobatics and stunts, to shoot at targets, to take high quality video and to fight other drones – to the death. If you’re going to race, then you will be buying plenty of replacement batteries props, ESCs, frames and motors. Because sh*t happens. Things break, when they fall out of the sky. So make sure you consider the cost of replacement parts before you commit to a particular racing class or league. In general, you will need to replace something just about every race. Usually props. LOTS of props. Most drone racers bring a complete set of backup props, a couple of ESCs, one or two replacement motors and at least 2-3 pre-charged batteries to every event. Unlike other types of drones, warranties on racing quads are tied to the individual components and only cover defects. They don’t normally cover damage caused by competing. If something breaks during competition due to crashing, etc. then you’re out of luck. This applies to both RTF rigs and ATF drone kits. There are dozens of enthusiast blogs and forums on the Internet where dedicated drone racers hang out and discuss the finer points of modding, race rules and the latest gear. Amazon.com: always worth checking for price; free shipping, too. Helipal.com: experts at RC quad racing, awesome customer service. Drone Racing Guide – Beginner Level: The Complete Guide to Drone Racing ($2.99 ebook): A Great, easy-to-read introduction to the art of FPV racing. A step-by-step process to move from awareness of basic flight controls to advanced acrobatics. 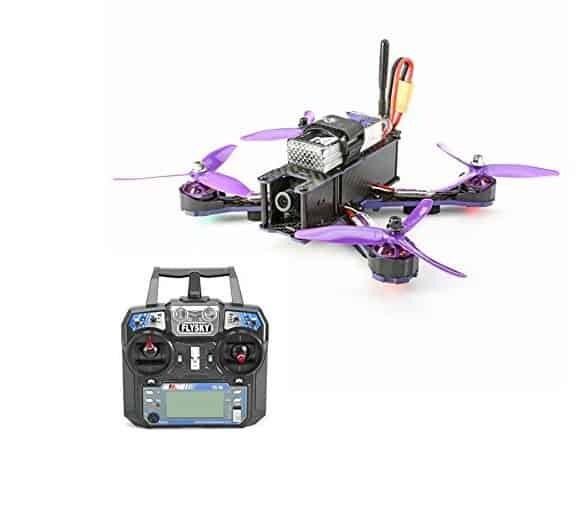 This entry was posted in Drone Buying Guides, Racing Drones, Recreational Drones and tagged amateur, best quadcopter kits, Blade Inductrix, FPV racing, Hubsan X4, QAV250 G10, racing drone, ready to fly, semi-pro, storm Type A, Tiny Whoop, Vortex 250 PRO.